Autumn’s arrival brings cooler temperatures, big yellow buses, colorful and falling leaves (at least in some parts of the country), football and unwanted house guests — in the form of mice and other rodents. 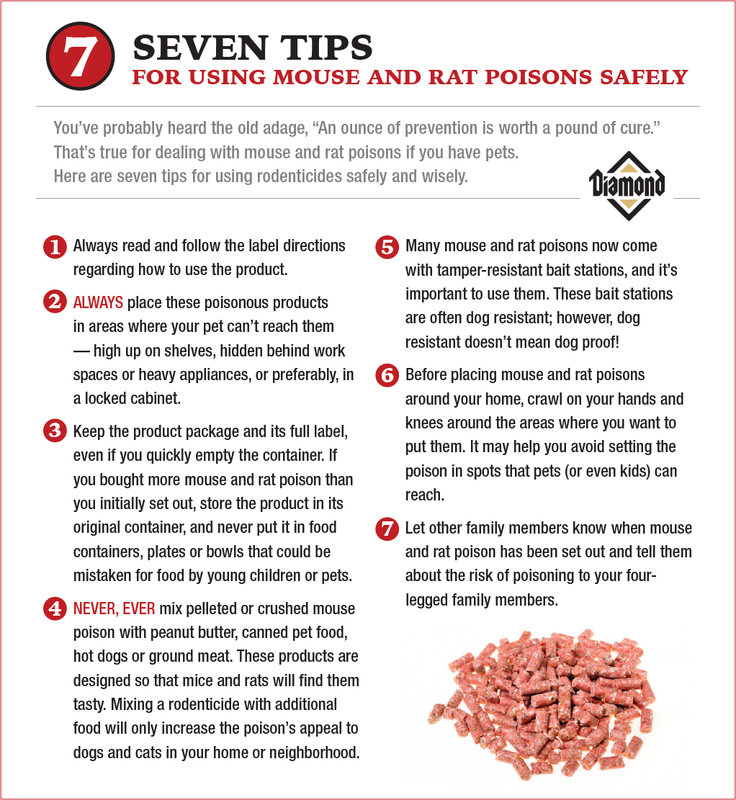 Before buying and placing any mouse and rat poison in or around your home, there are several things every pet owner should know about these products to avoid accidental poisonings. Mouse and rat poisons, also known as rodenticides, come in a wide variety of colors, shapes, sizes and active ingredients (the “poison” in the products). Rodenticides can look alike and contain active ingredients with similar names, but be very different types of poison. So if your pet eats mouse or rat poison, accurate identification of the poison is critical because it determines the risk of poisoning and the type of treatment that may be needed! The most common and well-known type of rodenticides, long-acting anticoagulant products prevent blood from clotting normally, which can lead to internal bleeding. The amount a dog or cat needs to eat for poisoning to occur varies greatly between the active ingredients in this category and also depends on your pet’s weight, age and health. Signs of internal bleeding appear two to three days after a pet has eaten a product containing an anticoagulant. Other signs can include loss of appetite, vomiting, diarrhea (with or without blood), bruised skin, bloody urine and bleeding from the gums. Fortunately, an antidote to long-acting anticoagulant-containing poisons is available from your veterinarian. Bromethalin, another common type of mouse and rat poison, causes swelling of the brain and spinal cord. Only a small amount of this poison needs to be consumed before signs of poisoning occur. Cats are particularly sensitive to bromethalin, meaning a very tiny amount can cause life-threatening symptoms and worse. Signs of bromethalin poisoning can include incoordination (stumbling or staggering), paralysis, tremors and seizures. Pet Poison Helpline, one of two animal poison control centers in North America, does not recommend using this product in or around your home if you have a cat. If you think your pet has eaten mouse or rat poison — or anything potentially dangerous — call your veterinarian immediately or one of the two animal poison control centers in North America, Pet Poison Helpline (1-800-213-6680) or ASPCA Animal Poison Control Center (1-888-426-4435). The sooner you speak with a veterinary professional, the sooner you can take the appropriate steps to help your pet and avoid potential trouble. If you know your dog or cat ate mouse poison, you’ll want to have the product package handy because you’ll be asked to provide the EPA registration number from the package or the name of the active ingredient and its concentration (all of this information can be found on the product bag, box or bucket). Many pet owners have heard of inducing vomiting when their dog or cat has eaten something that’s potentially poisonous. While it can be helpful, inducing vomiting isn’t always appropriate and could actually be harmful. And with cats, there’s no safe way to induce vomiting at home — if it needs to be done, it must be under the supervision of a veterinarian. No one wants to share their home with unwanted rodent guests, just as no one wants to accidentally poison their pets. The best thing you can do to minimize the risk for unintentional poisoning of your dog or cat is to learn about these products and how to use them safely. And if the unthinkable happens, you want to know who to call and what to do. For more information about potential pet poisons, be sure to check out the Pet Poison Helpline and ASPCA Animal Poison Control websites.